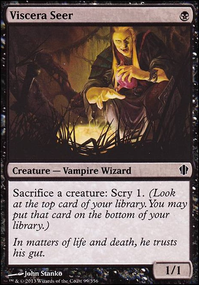 Discard a card, Sacrifice Overeager Apprentice: Add (Black)(Black)(Black) to your mana pool. DiverDown, with Grenzo already in play it takes 5 total mana (3 of which must be Black) to cast Doomsday and combo out. Priest of Gix or Priest of Urabrask or Overeager Apprentice + Kiki-Jiki, Mirror Breaker (tap to make a copy of the priest) + Skirk Prospector + Murderous Redcap (sac Redcap and Kiki to Prospector and with Redcap's Persist trigger on the stack use Grenzo's ability again) + Metallic Mimic (the +1/+1 from Mimic will cancel out -1/-1 from redcap's persist for infinite direct damage when sacrificed to Prospector). LostDragon01 on PDH(B) - I'm not dead! I feel fine! You should add all mana-generating creatures. Why not? It faster Shirei and then more mana each turn. Do you have any thoughts about Treasonous Ogre over Overeager Apprentice? Its good in the main pile and can produce more mana then Overeager Apprentice. @Force_of_Willb - Ancestral Knowledge will shuffle the library when it leaves so you need to pay the upkeep for a turn or two at least. it's also a bit pricey. 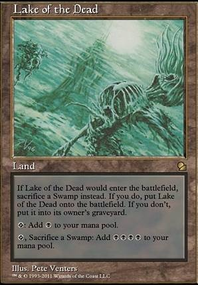 Deadbridge Chant is one of my favorite cards and I had it in here when I first built the deck but it never stuck around for more than the turn I cast it. I might find a spot for it but at the moment I don't think there are any cards in here that are less useful. Dreamborn Muse is great and I put in Forgotten Creation which is similar but I ended up taking it out because in my playgroup if the card doesn't do something the turn it is cast or has an ability that can be activated at instant speed then it is very likely it will get removed before you get any use from it. Also muse can potentially help my opponents or make them hate me and target me more than usual. I really appreciate you input on what to remove since that is always the hardest thing to decide when I get great suggestions. Nyx Weaver is a card that is on the fence. I have him in currently because he is basically a draw 2 additional cards each turn but the main reason is that I can count him as an enchantment or creature for Muldrotha's ability. Body Snatcher is part of the Hulk chain so he has to stay. Aid from the Cowl is something I just added in but have not yet got to try it out. 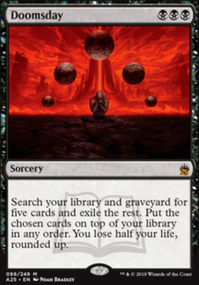 It seems promising since it will trigger at the end of the turn I cast it so I'm excited to see it play out and it costs less than Deadbridge Chant and doesn't rely on my graveyard. In my playgroup my yard usually gets exiled a few times each game so Cowl can still be an advantage without my yard. Overeager Apprentice is an all star in a few of my other decks and I recently added him in here to see if he works out. I might remove him after some testing. Other cards that I'm not 100% sure on are Spellskite and Mishra's Bauble. I may remove one to add in Tezzeret the Seeker since he can tutor any of the artifacts in the deck the turn he is cast (with the exception of Mindslaver). Thanks for the comment! Don't for get to +1 if you like the deck! 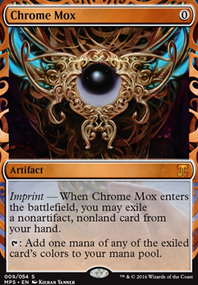 Vorinclex: great, especially if you Entomb+Reanimate on early turns because of the ramp/stax effect. I'd remove a basic swamp for it so Hermit Druid become more suitable for a nice self mill, once you've managed to get rid of your 6 basics with Sakura, Farhaven Elf, Tusker or Simulacrum + some Meren recursion tricks. What do you think about including Twilight's Call? And what about replacing Grave Pact with Dictate of Erebos (or maybe using both of them)? sonnet666 on Demon School for Demons, Cool. I was also thinking Bitterblossom might not be worth it, for the same reasons you mentioned. Hangarback Walker is an easy replacement for that. I suppose I can also take this opportunity to swap Walking Ballista for Exsanguinate for the plan B wincon. I was hanging on to Walking Ballista because it could be used as a pseudo 0-drop with Genesis Chamber and Pawn of Ulamog, but if Hangarback Walker can do the same thing we might as well have an extra way to get our life total back up now that the tutor chains are looking to be longer. I don't think Krark-Clan Ironworks is a good fit here, mostly because most of our artifacts are either already self-sacrificing, or are creatures and better off being fed to Raz. I only see about 11 artifacts I'd expect to want to sacrifice to it, which isn't enough to expect it to pay for itself pre-Raz. I assume that you can just replace Overeager Apprentice with Priest of Gix right off the bat. 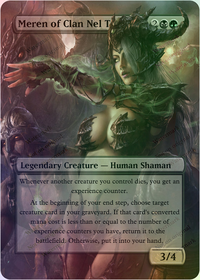 And what is your opinion of Bog Witch? If you're looking for something similar to Overeager Apprentice maybe Skirge Familiar?